The Best of both worlds! 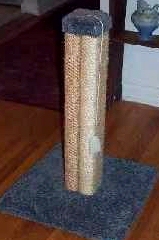 One side is genuine Brazilian sisal rope. The other side is a durable sisal weave. For split "puss-onalities!" 23" tall with 14" base. Colors are earth tone, blue, and green. Please indicate second and third choice colors. Also, To avoid shipping delays, please select your state from the drop-down menu.